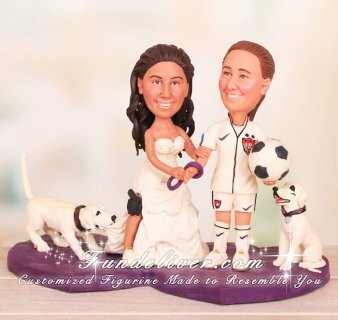 This is a completely customized Lesbian wedding cake topper ordered by one of our customers. They would like the bride to be in a wedding dress with a slit in the side and a gun, in a holster, on the thigh. The bride is holding a pair of purple handcuffs and has one handcuff around the right wrist of the "groom" (really the other bride). The bride has her left hand holding the right forearm of the "groom" and the handcuffs in her right hand as she handcuffs the "groom". She is wearing a USA Women's National Team soccer jersey and shorts, as well as soccer cleats, soccer socks up to just below her knees, and holding a soccer ball in her left hand. Her hair is in a ponytail. 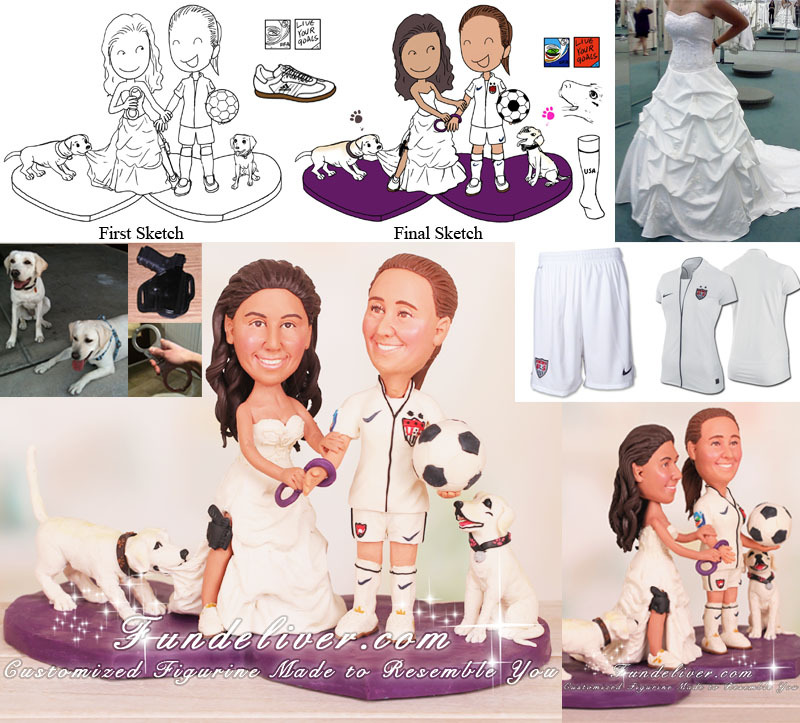 They would like to add their two white Labradors. One is skinny (her name is Tarpley) and one is fat (her name is Solo). The skinny one wears a black collar with pink paw prints. The fat one wears a light blue collar with brown paw prints. The skinny one (Tarpley) is on the “groom’s” left sitting and staring up at the soccer ball very intently. There is a small scar near the left eye of the skinny dog. The fat one (Solo) is on the bride’s right pulling the bottom of the bride’s dress in her mouth that looks like she is trying to play tug of war with the bottom of the dress.